Don't you just love it when you come across a recipe that is easy, delicious and versatile to boot? I wish I could say the same about the spelling! Hjónabandssæla means 'wedded bliss' and is an Icelandic 'happy marriage cake'. 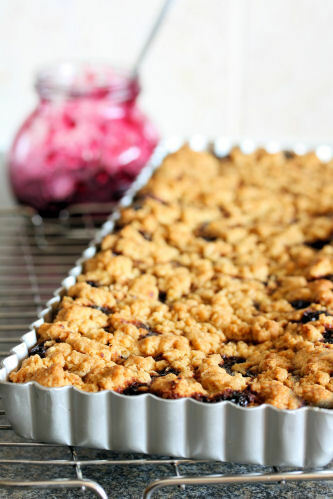 It's not really a cake though, more like an oat bar/pie filled with blueberry jam, although you could use any kind of jam - cherry jam would be brilliant or you could use some sort of rhubarb filling. I found the recipe on The Icelandic Amateur Chef, a beautiful food blog written by Guðmundur Birkir Pálmason. 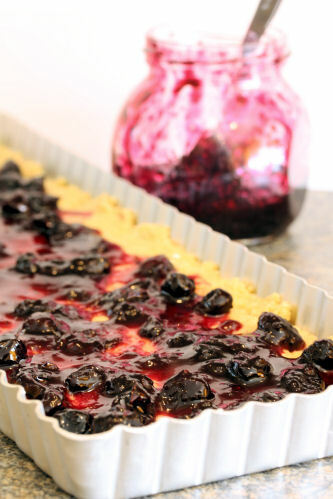 I'm not going to put the recipe in this post because I didn't alter it at all, but you can find it here: Hjónabandssæla or Oatmeal and Blueberry Pie. Looks delicious as does the blueberry jam. It's quite an alternative to the wedding cakes we're used to. Nic, that looks so yummy and you can't beat home-made jam! Blueberries are still my favourite even after all these years! I had a wonderful long weekend in Iceland a few years back and was totally blown away by the food (as opposed to any volcano's lol). Never came across this little gem though and I can't wait to give it a try. Certainly looks good Nic and I do love blueberries! Hjónabandssæla (yes, of course I copy/pasted the name) looks as lovely as its meaning! I cannot wait for blueberry season! oh wow! that does look easy and delicious! This looks gorgeous... you've not summonsed up a volcano with it though have you?! Such a beautiful name and also a beautiful pie! Oh wow Nic! Mmmmmmmmmmmm :P Oh and that last pic with the swirled clotted cream. I am undone! I think this is the first Icelandic recipe I have ever seen! I absolutely love the colours of your photos in this post. 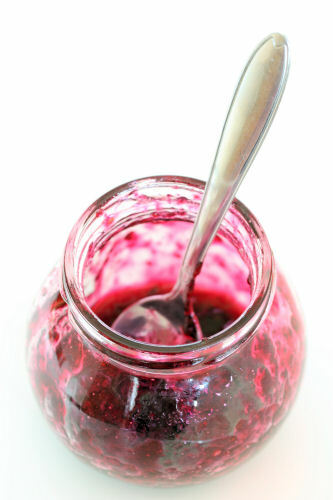 Such a beautiful purple in the jam - especially when swirled with the clotted cream... mmmmmm! Oh my word... that last photo was the kicker. 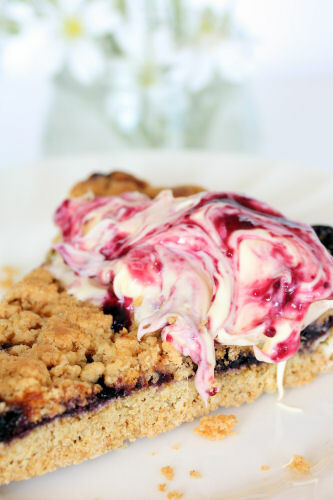 Just the idea of all that creamy goodness oozing over the tart berry crumble is enough to send me overboard! !